Globe Loan Jewelry Co address, phone, website, hours of operation, and more. 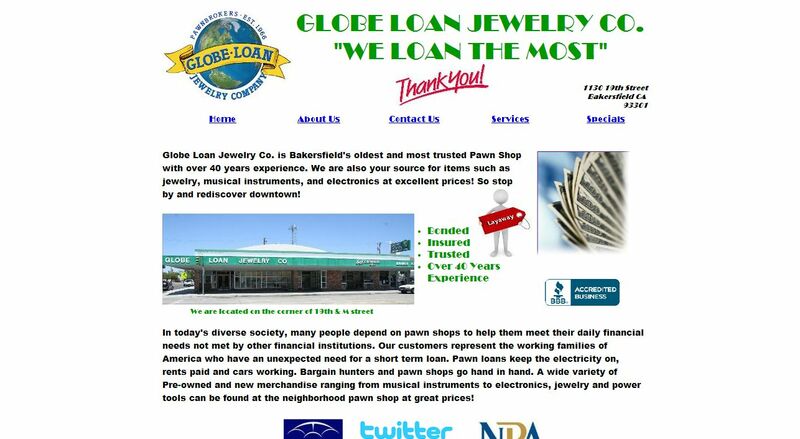 Globe Loan Jewelry Co. is Bakersfield’s oldest and most trusted Pawn Shop with over 40 years experience. We are also your source for items such as jewelry, musical instruments, and electronics at excellent prices! So stop by and rediscover downtown! In today’s diverse society, many people depend on pawn shops to help them meet their daily financial needs not met by other financial institutions. Our customers represent the working families of America who have an unexpected need for a short term loan. Pawn loans keep the electricity on, rents paid and cars working. Bargain hunters and pawn shops go hand in hand. A wide variety of Pre-owned and new merchandise ranging from musical instruments to electronics, jewelry and power tools can be found at the neighborhood pawn shop at great prices!